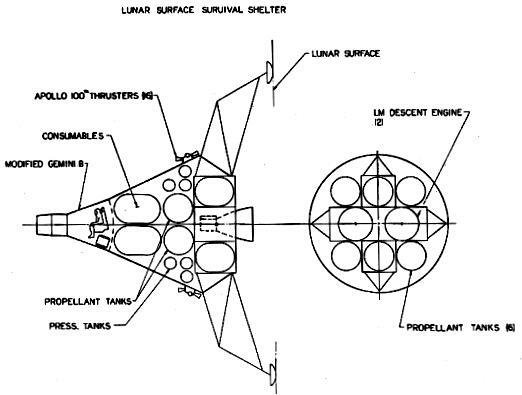 Drawing of the Gemini Lunar Surface Survival Shelter. The shelter would be landed, unmanned, near the landing site of a stranded Apollo Lunar Module. In the event the LM ascent stage would not light to take the crew back to the Apollo CSM in lunar orbit, the two astronauts could go to the shelter and await a rescue mission. The astronaut in the CSM would return alone in the Apollo spacecraft. American manned lunar habitat. Study 1967. Prior to an Apollo moon landing attempt, the shelter would be landed, unmanned, near the landing site of a stranded Apollo Lunar Module. Status: Study 1967. Thrust: 88.06 kN (19,797 lbf). Gross mass: 45,000 kg (99,000 lb). Unfuelled mass: 15,000 kg (33,000 lb). Specific impulse: 311 s.
In the event the LM ascent stage would not light to take the crew back to the Apollo CSM in lunar orbit, the two astronauts could go to the shelter and await a rescue mission. The astronaut in the CSM would return alone in the Apollo spacecraft. Lunar Orbit Rescue Gemini: Modified Gemini & repackaged LM Ascent Stage. Unmanned to lunar orbit, three man direct return. Advantages: Uses developed equipment. Disadvantages: New spacecraft development. Recommendation: Do not develop-rescue capability too limited. Greatest emergency potential at lunar surface. Lunar Orbit Rescue Apollo: Apollo CSM. Unmanned to lunar orbit, three man direct return. Advantages: No new development. Can be accomplished with current acquisitions. Disadvantages: Possibility of same failure mode. Recommendation: Do not develop-rescue capability too limited. Greatest emergency potential at lunar surface. Lunar Surface Survival Shelter Gemini: Vehicle Description: Modified Gemini & Modified LM Descent Stage. Mission: Unmanned to lunar surface, 28 day quiescent storage, 28 day 2-man operation. Advantages: Extension of lunar orbit vehicle. Disadvantages: New spacecraft development. Recommendation: Do not develop - need for shelter and total number of Saturn launches reduced by providing an on-station backup return capability. Lunar Surface Survival Shelter Apollo: Vehicle Description: Modified SM & Modified LM. Mission: Unmanned to lunar surface, 30 day manned operation. Advantages: Similar to planned post-Apollo exploration shelter. Disadvantages: Requires modifications to existing hardware. Recommendation: Do not develop - need for shelter and total number of Saturn launches reduced by providing an on-station backup return capability. Lunar Surface Rescue Gemini: Vehicle Description: Modified Gemini, repackaged LM Ascent Stage & Modified LM Descent Stages. Mission: Unmanned to lunar orbit, 30 day unmanned quiescent stay, 2 man direct return. Advantages: Extension of lunar orbit/shelter vehicle. No rendezvous required. Direct return. Disadvantages: New spacecraft development. Recommendation: Modify to a 'Universal' Rescue Vehicle by improving capability to cover three-man cases. Lunar Surface Rescue Apollo: Vehicle Description: Apollo CSM & LM. Mission: Unmanned to lunar orbit, LM to lunar surface, LM to lunar orbit, 2 man return. Advantages: No new development. Same as existing mission. Disadvantages: Rendezvous required. May be difficult to automate transpose docking. Recommendation: Modify to a 'Universal' Rescue Vehicle by improving capability to cover three-man cases. McDonnell concluded that an unmanned Gemini 'Universal Lunar Rescue Vehicle' could be developed that would perform all three tasks. The Gemini capsule would be extended to allow up to three rescued Apollo crew members to be returned. Such a craft could rescue the entire Apollo crew at any point along the Apollo mission profile. Some sketches appear to show a two-man Gemini crew in addition to three crew couches in the Gemini capsule extension. The unspoken point was that the Saturn V was in fact large enough to land men on the moon using the direct-ascent method. Use of lunar orbit rendezvous was only necessary because of NASA's adherence to the 6 metric ton, three-crew Apollo command module design. The 2 metric ton Gemini capsule, even in a form stretched to accommodate three to five crew, could accomplish a direct landing on the moon using Apollo components. This last attempt to resuscitate Lunar Gemini failed as well. At that point in the Apollo program cut-backs already had begun. No funds would be forthcoming to build additional launch vehicles and spacecraft beyond those already purchased. There was definitely no money to provide a rescue capability, using either Apollo or Gemini hardware. Crew Size: 2. Habitable Volume: 3.00 m3. Spacecraft delta v: 3,400 m/s (11,100 ft/sec). Family: Lunar Landers, Moon. People: McDonnell. Country: USA. Spacecraft: Gemini Lunar RM, Gemini LSSS LM, Gemini LSSS SM. Launch Vehicles: Saturn V. Propellants: N2O4/UDMH. Agency: NASA. Bibliography: 209.